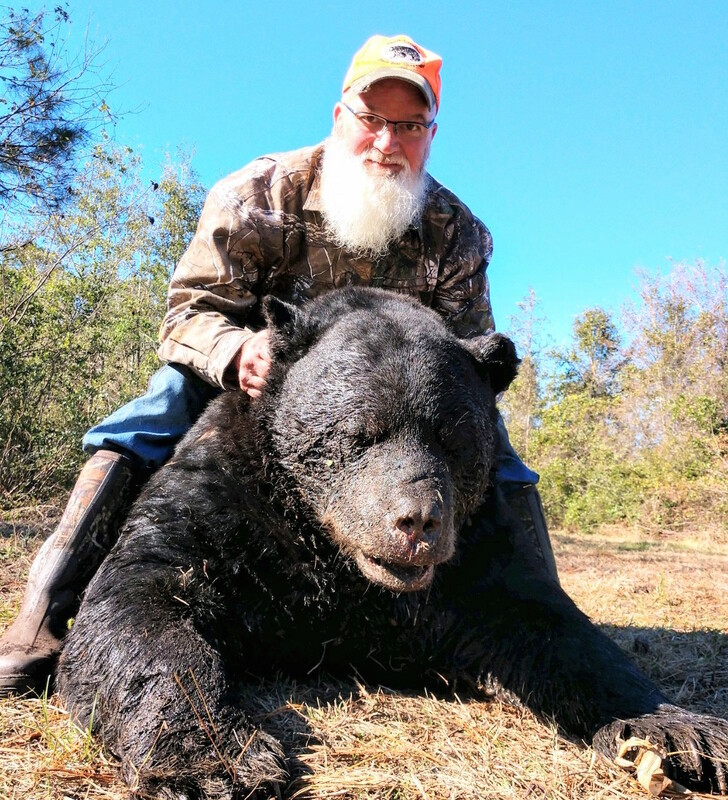 500-yard shot downs 600+ pound bear in Pamlico County, N.C.
Jeff Murphy of Madison, N.C. killed this trophy black bear in Pamlico County with a 500-yard shot from his Winchester 7mm STW on Nov. 13, 2018. 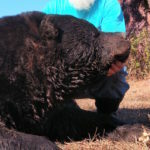 Another view of Jeff Murphy’s eastern N.C. black bear. 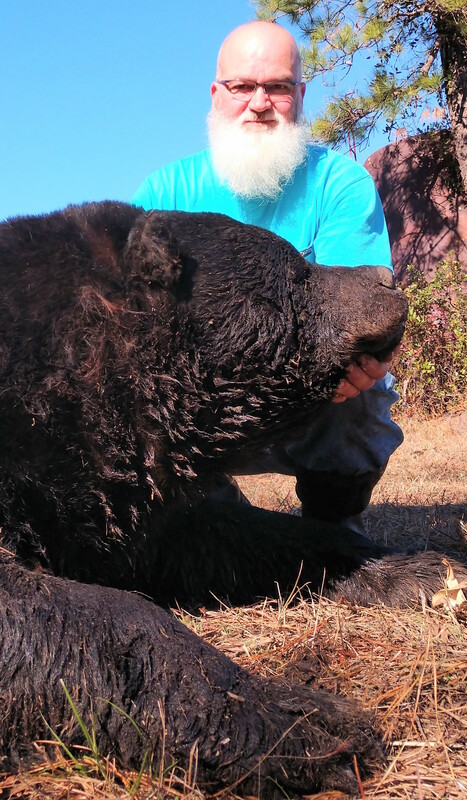 Jeff Murphy of Madison, N.C. isn’t new to bear hunting — he’s killed nine bears in the past 15 or so years — but the one he killed on Nov. 13 was one unlike any he’s ever seen. Even from 500 yards away, which is the distance the bear was when Murphy shot it, he could tell it was abnormally large. 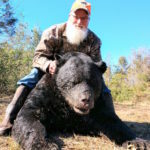 Unfortunately, once Murphy found the bear, he couldn’t find any place that had big enough scales to weigh it, but it’s been estimated at over 650 pounds, and the skull has been green-scored at 22, which will land the bear in the Boone and Crockett Club if it shrinks less than 2 inches during the 60-day drying period. “I saw the bear standing almost directly under my friend’s stand at that distance. He was hunting in another area and told me I should sit in his stand, but I decided to hunt my own because I had seen another nice bear there before. 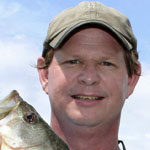 If I’d been in his stand, it would have been about an 8-yard shot,” he said. Murphy was hunting from an elevated box stand overlooking some thickets and began the day early. 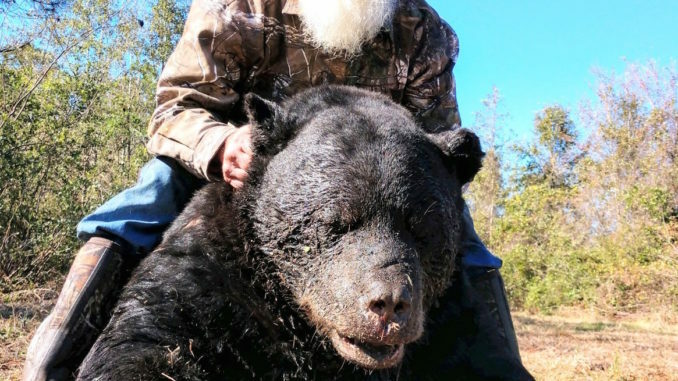 Just after first light, he saw some small bears, and the big one showed up around 7:15 a.m. Murphy is perfectly confident with his Winchester 7mm STW, so he didn’t hesitate to pull the trigger once the bear offered him a shoulder shot. He was sure he hit the bear, so he climbed down and he and his friend began the search. It was difficult going for sure. “That whole area is still really flooded from those hurricanes and recent rains. There’s just nowhere for the water to go, so everything was just flooded. We figured out the most logical way for the bear to have gone, and we began searching. We looked and looked but unfortunately we didn’t find him that day,” he said. Murphy hunted the entire week, and by Saturday, he spotted buzzards near his friend’s stand. He followed the birds and found the bear not far away, but in an area they did not look before.